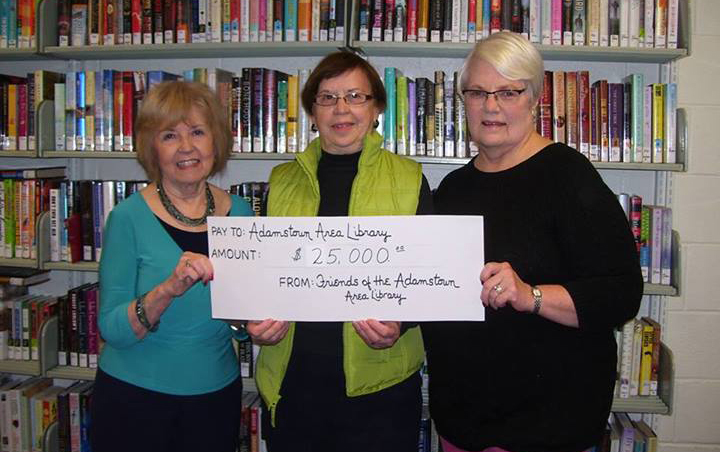 The purpose of the Friends of the Adamstown Area Library is to maintain an association of persons interested in books and libraries, to focus public attention on library services and needs, to stimulate gifts of books for the purpose of resale, to foster volunteerism, and to enrich library resources through fundraising projects. Our dedicated Friends group has always been inspired to work diligently for our projects, knowing the impact we have on the library services offered. Between 1996 and 2015, we raised $689,912 for the library through over 50 varied and sometimes unusual projects. Our main focus remains on our annual book sale, basket bingo, and the annual Bucks for Books dinner and auction. Our annual report shows over 75 activities that we have held or sponsored over our history as well as donations to the library other than financial aid. Of course, without your wonderful support and the caring community, this would not have happened. Why the Friends are Important . . .
Because library services are vital to life-long learning for all ages, and to community stability and revitalization. Because our library is a rich community resource. Because the library budget does not cover all of the collections, programs, and equipment needs of our service areas. What the Friends Do . . .
Promote the library and its educational, informational, cultural, and literacy resources. The Friends is a dedicated group of volunteers committed to promoting the interests of the library. The Friends are tasked with raising funds to supplement the library’s budget to provide enhanced services to the more than 30,000 residents of the Boroughs of Adamstown and Denver and the Townships of Brecknock, East Cocalico, and West Cocalico. In 2015, the Friends were able to donate $42,000 to the library. What the Friends Provide . . .
Community Strengthening: Serving as a conduit for people throughout our service area to enrich each other and the communities. Collection Development: Supplement the library’s funds for books, CDs, DVD’s, tapes for children and adults, and other materials to serve the communities and their needs. Volunteer Opportunities: augment the staff. Advocacy: Increase the awareness of the library as a vital part of our communities.